I love the changing of seasons. 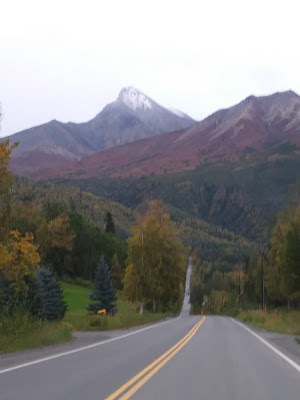 We've been in spots the last fall/winter where it seemed to just get rainier when fall and winter hit. I have looked forward to distinct seasons. There isn't a lot of color here, but enough to make it fun to watch the trees. Even more indicative of a season change than leaf color is, "TERMINATION DUST." 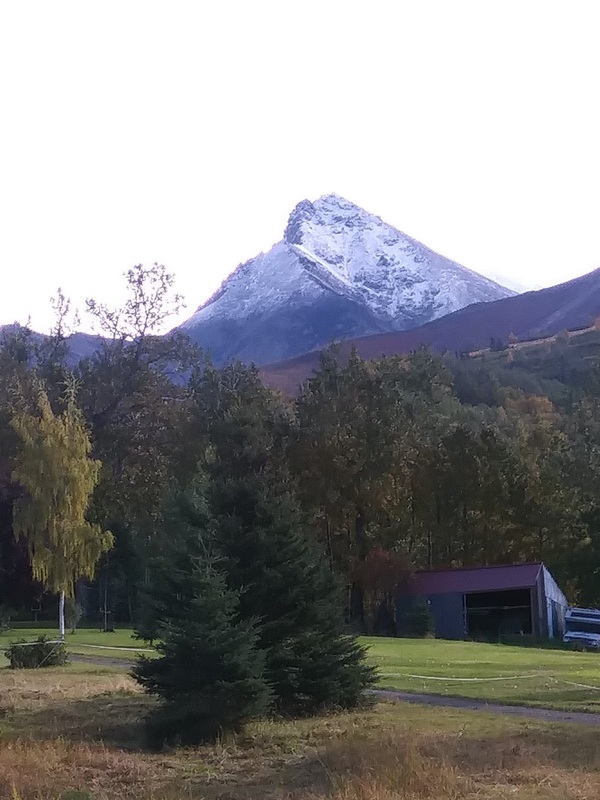 This is the first sprinkling of snow on the mountains. 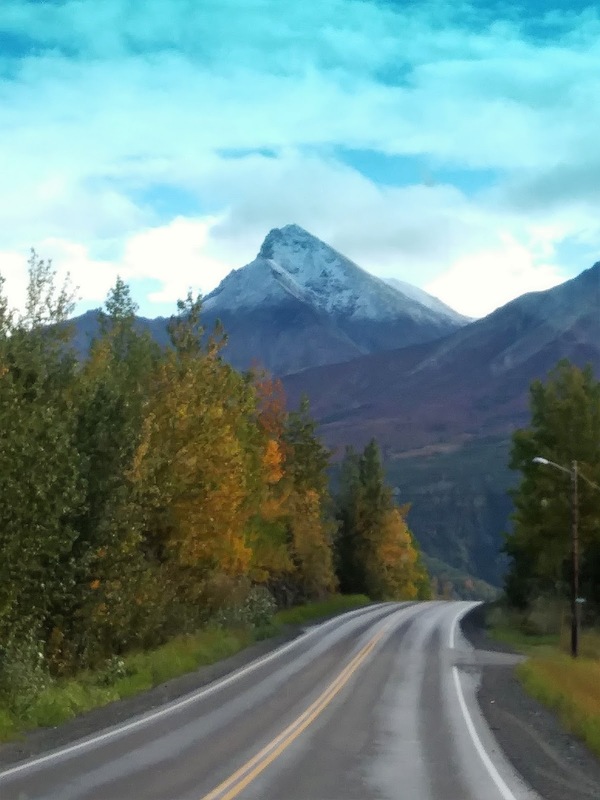 We have been noticing snow on the mountains since Mid August - but not on OUR MOUNTAINS. Yes, it is! The trail head to these peaks are at the end of our road....Michael said we had to wait and see if the snow stayed over night before we could say it was termination dust. He noted we wouldn't know for sure until it began to come down the mountain. 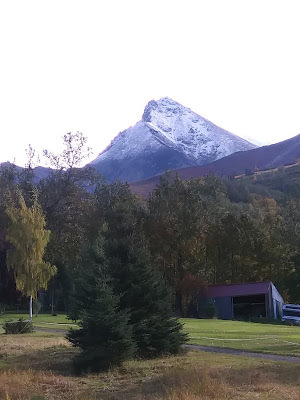 Winter is truly here when the snow reaches us at the bottom of the mountain. 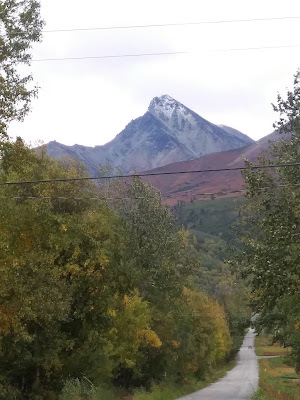 Still snow on the peak on Thursday. It's official - the seasons are changing. Fall is here and winter is fast on it's heels. Are you ready for a fun fall contest? When do you think the snow/winter will arrive down here in the valley? ⛄⛄⛄It must be enough snow to stay for a bit...not just flakes in the air. Leave your vote in the comment section and there will be a small prize for the person who comes the closest. I'm pretty sure Michael will want to firm up what constitutes "snow in the valley," so I'll add that info later. *Note none of these photos were taken on our street nor from our yard....just driving home. Our street is off this road. October 5th is my guess! It always snows on Halloween in southern Idaho. I am betting you get a full month jump on them. October 4th - the day of the celebration of St. Francis is Assisi! You are all guessing far earlier than I was thinking....or hoping for. It is getting crisper in the mornings and we are having rain so I suspect you may be right. 38 degrees and drizzle this a.m.